To assist members in preparing the new version of Form ADV Part 1, the IAA has published a checklist of the new and amended Items in Part 1A of Form ADV. The checklist outlines the new and amended Items that include information about the asset types held in an adviser’s “separately managed accounts” (SMAs), as well as derivatives and borrowings information in the SMAs for advisers with certain minimum SMA RAUM and account sizes. 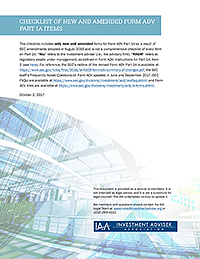 The checklist also covers new Items about a firm’s business, including: the number of clients and RAUM attributable to each of 14 categories of clients; website addresses of publicly available social media sites over which the adviser controls the content (but not sites of its employees); the 25 largest branch offices; custodians that account for at least 10 percent of SMA RAUM and the amount of such RAUM held at the custodian, as well as its location; whether the adviser’s CCO is “outsourced” (e.g., compensated or employed by anyone other than the adviser, a related person to the adviser, or a mutual fund advised by the adviser); and whether the adviser has “parallel managed accounts” relative to registered investment companies and business development companies. The checklist also includes information about the SEC’s new option for “umbrella registration” for private fund advisers on new Schedule R, as well as new glossary terms and a discussion of SEC FAQs on the new Items. As a reminder, advisers are required to file the new version of Form ADV Part 1 with their first amendment filed after October 1, 2017.